Well, if you haven’t heard, Thanksgiving and Hanukkah have melded together into Thanksgivikkah. 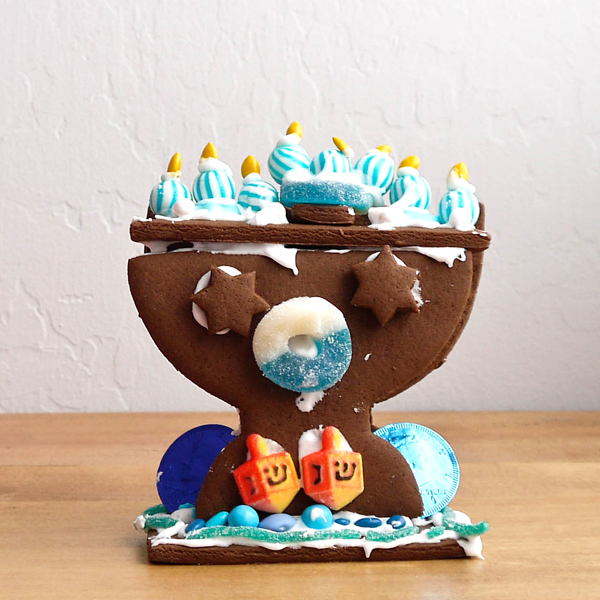 And there’s no better way to celebrate than with a gingerbread menorah. I discovered this wonderful melding of deliciousness through Sweet Thrills Bakeshop, a collaboration of two Bay Area moms who believe the kitchen is the heart of the home and that sweet treats make everyone smile. These smart ladies are packaging chocolate gingerbread menorah kits that are perfect for families to build and decorate together. 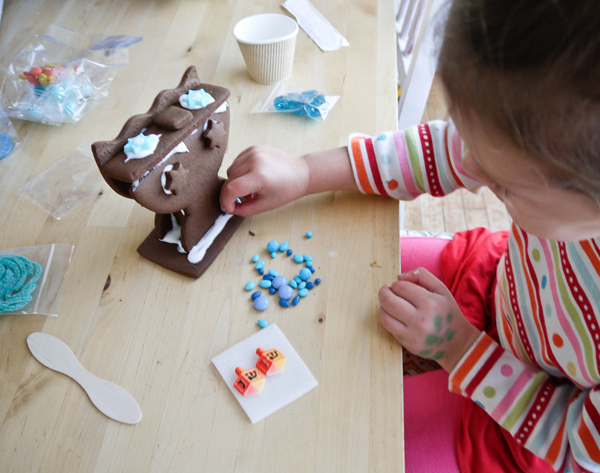 The unique idea sparked from spinning the dreidel with a traditional gingerbread house in the background. The result? 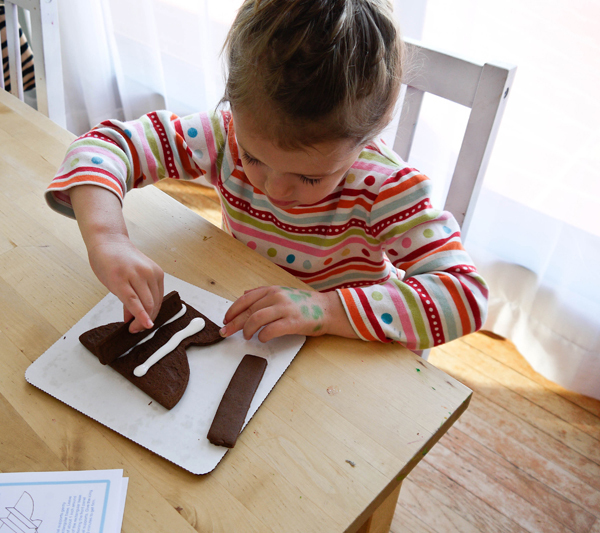 A sweet twist on celebrating Hanukkah — and a great way to create special memories with your kids. I was so excited to get my hands on a box and make one with my tot. Yes, probably even more than she was. Included in the kit was everything needed to assemble the menorah, including a wonderfully detailed set of directions, helpful tips, and educational information about Hannukkah, making this kit fitting for any family. My daughter jumped right in and loved assembling the menorah. In fact, she was pretty much able to follow the drawn directions on her own (while I snuck a few candies that were included in the kit). What’s great about the kit is that along with being creative, your child is learning about construction and design. As it states in the directions, it’s important to let the the frosting set between steps, but we found ways to entertain ourselves while waiting. We enjoyed reading the included information about Hanukkah, counted the candy candles, and, of course, had to sample the frosting. My daughter really took her time working on her special menorah and we have it proudly displayed on our mantel. She loves telling us how she made it all by herself. Sweet Thrills Bakeshop has two different sized unassembled menorahs as well as a mini pre-assembled menorah available this season. Order now to ensure your kit arrives on time. We’re looking forward to enjoying our menorah during our Thanksgivikkah celebration! And, did I mention? They’re delicious. 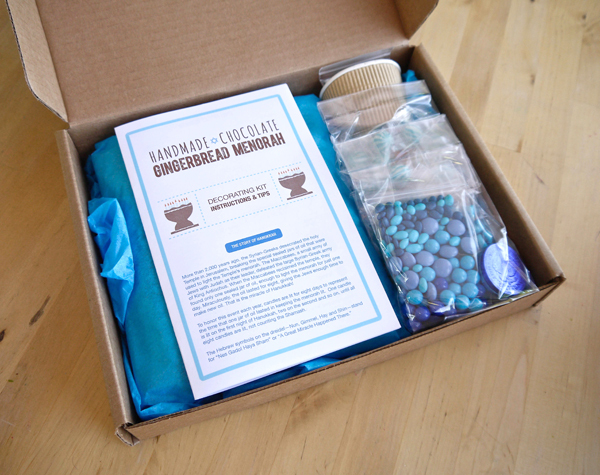 *Just so you know, I am actually friends with one of the co-owners of Sweet Thrills Bakeshop and volunteered to do this review simply because I think this chocolate gingerbread menorah kit is seriously awesome. And delicious. And a fantastic idea. This looks like so much fun! Every thanksgiving we get together with our extended family- we all have kids and we try to come up with crafts and activities for the kids to do together. Since we’ll be celebrating Hanukkah as well, this would be such a great addition to our crafting activities. The kids would looooove it! Thanks for sharing.